From January through December, let's take a look at what Tennessee has to offer this year. For Tennessee anglers, fishing is a year-round venture. With so many bodies of water in our state, choosing where to fish can be the hardest task of any fishing trip. No matter where you live in the state, Tennessee outdoorsmen are blessed with countless bodies of water to choose from. 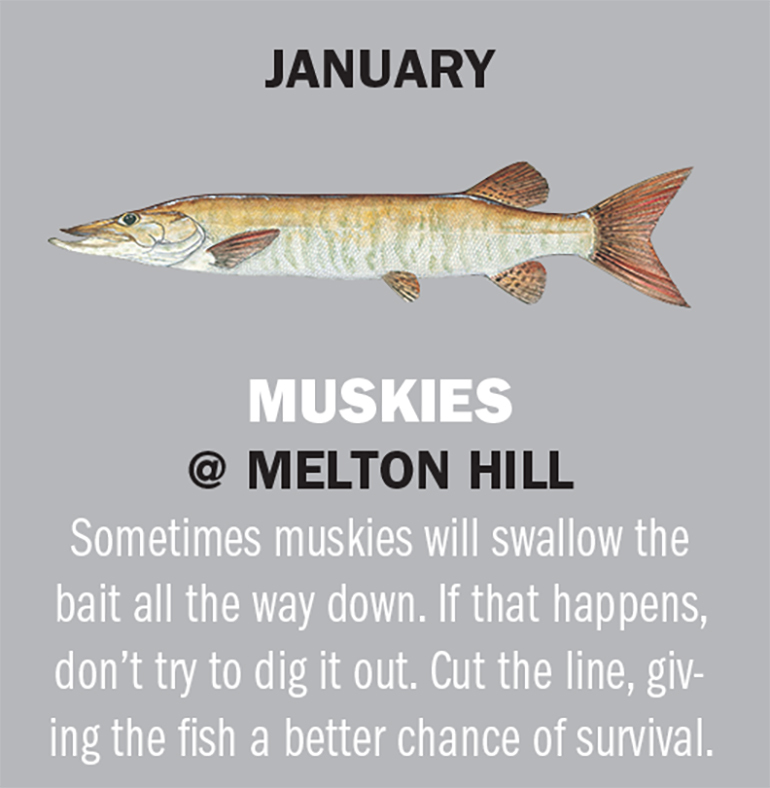 A newcomer to the Tennessee fishing scene, muskies have gained a following among wintertime fishermen, particularly in East Tennessee. Stocked by the TWRA, these fish have thrived in Melton Hill’s cool waters, and winter is the time to catch a true trophy. Large spi nners, jointed plugs, and large swimbaits are the norm for big muskies. Fish around blowdowns and within the canal leading to the Bull Run steam plant. The area just downstream of the plant is also good during cold weather. Try to avoid using live bait in order to promote the survival of the fish. It can’t be stressed enough that catch-and-release should be practiced, as no natural reproduction has occurred with the muskie on Melton Hill. With the resource dependent on stocking, the TWRA has implemented a creel limit of one fish per day, with that fish needing to be 50 inches long. Other Options: Chickamauga Shellcrackers are partial to nightcrawlers dunked near the nuclear plant. To find Percy Priest Hybrids use the birds and your electronics then catch ’em on bucktails. Wintertime on Dale Hollow is about big smallmouths. The tried-and-true float-and-fly method is the ticket to catching big smallies in the winter months. This type of fishing is not about numbers, but the opportunity for a big bronzeback. Fish around bluffs and rock banks, letting the fly do the work. The float is going to give you casting weight and suspension, while the hair is going to give that subtle pulse that smallies find irresistible. Use light line to combat clear water conditions, and have your drag set loose. Suspended smallmouths aren’t going to chase a bait very far, so patience is the key. Anglers are allowed two fish per day, with a protected slot limit from 16 to 21 inches. One fish may be less that 16 inches, while one fish may be over 21 inches. OTHER OPTIONS: TWRA Stocked Rainbow Trout in hatchery supporte streams will strike corn (or, even better, worms or crickets) this month. At Norris Lake, gulls will lead you to stripers, which you can then catch with bucktails. If you live in Tennessee, it is virtually guaranteed that you live near a river or tailwater. 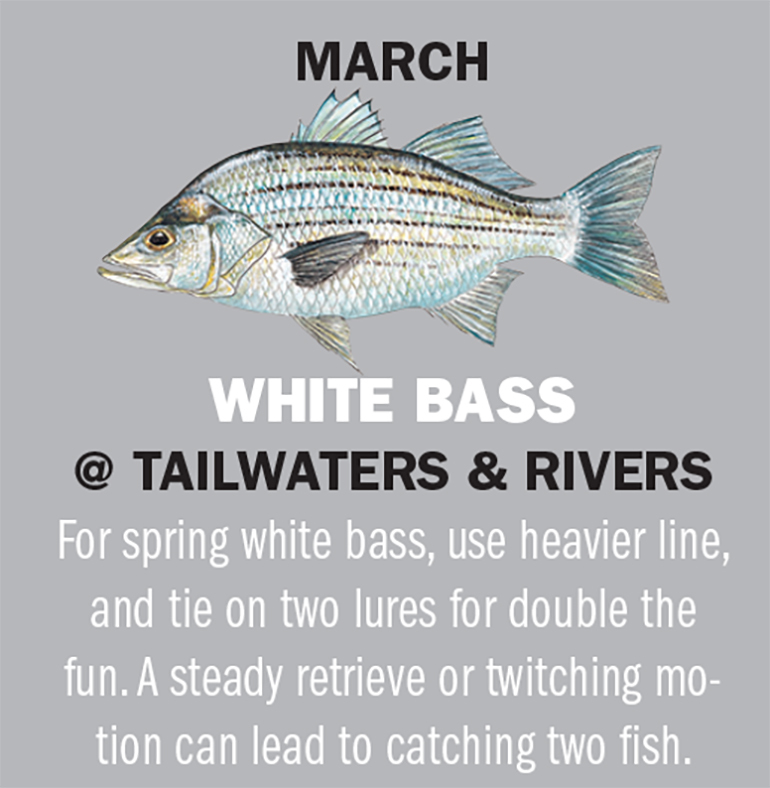 White bass are current spawners, and during March, large schools will begin making their runs upriver to deposit their eggs in the flowing water. Look for any moving water and cast twister tail grubs or spinners into the current. The old stand-by colors of white, chartreuse, and pink will be sure to get you bit, and ultralight tackle will add to the enjoyment. Depending on the current, anglers need not go much heavier than 1/8-ounce jig heads. This is also a time when bank fishermen can fill their stringers, as white bass will run the current seams near the bank. Fish in the 2- to 3-pound range are common, so keep a net handy for these bigger fish. This is some of the most consistent fishing of the year. OTHER OPTIONS: At Fort Loudoun, pre-spawn crappie will be stacking in brush situated on creek channel drop-offs. At Old Hickory, largemouth will be moving shallower, and can be caught using shallow running crankbaits. 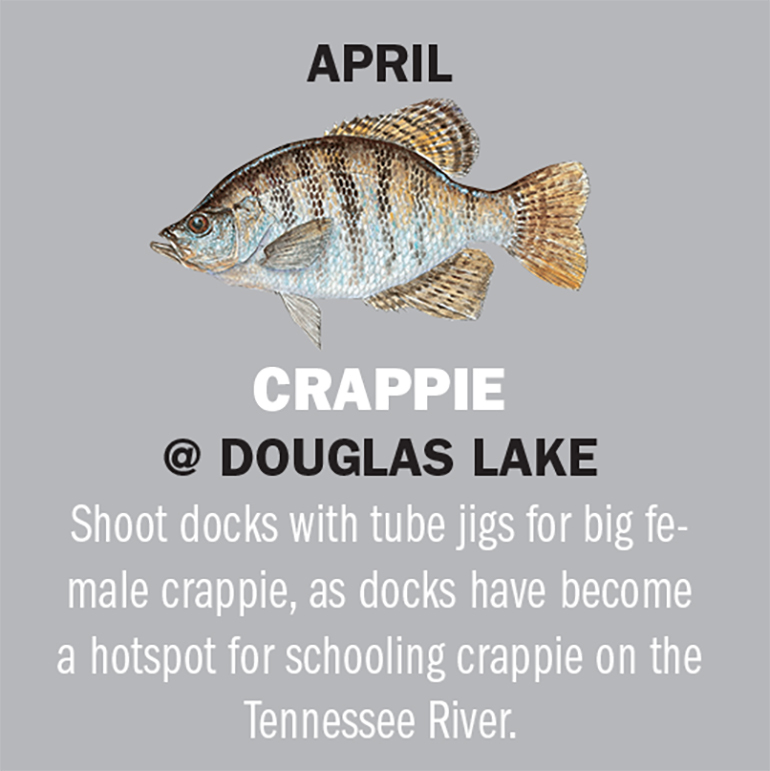 For Tennessee anglers, Douglas Lake is synonymous with crappie fishing, and April is primetime to fill your cooler with slabs. Anglers should expect fish to be moving shallow to spawn, and these crappie can be caught using various tactics. 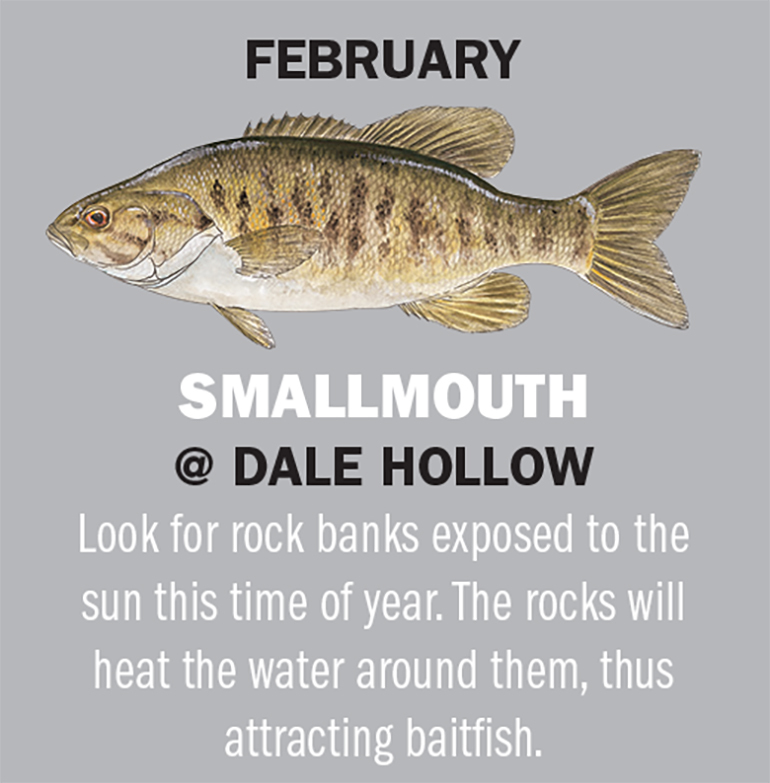 For fishermen who prefer to see a cork slip under the surface, look for shale rocks along the banks and on points that stick up 8 inches or more. Crappie will utilize these places to spawn, and can be caught casting flies, tube jigs, minnows, and Roadrunners. Continue moving until you find fish, and don’t be afraid to use your side imaging to locate schools of fish near the bank. For anglers who prefer to drift fish or spider rig, find the same shale banks, and position your boat in 5 to 10 feet of water, staying parallel to the bank as you drift or push. 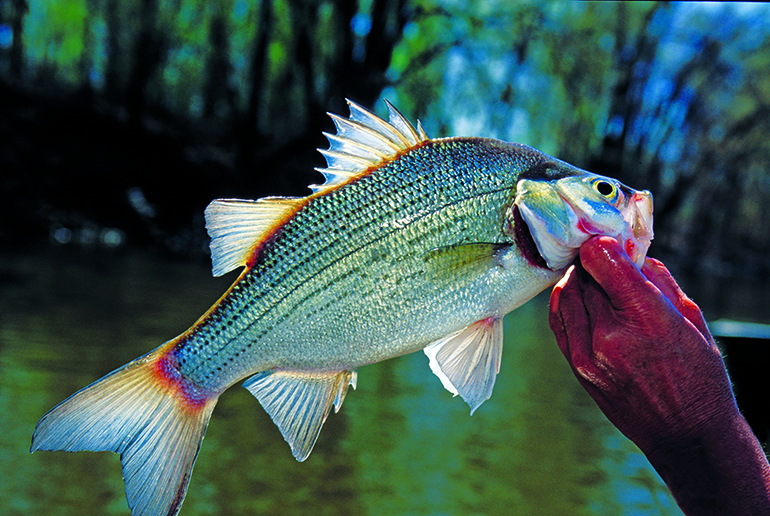 OTHER OPTIONS: Tennessee River yellow bass will fall prey to small spinners fished in the backs of coves. To hook Dale Hollow walleyes Nightcrawler rigs are the ticket in the lake’s clear water. May is the time for big panfish, and the place to get them is Kentucky Lake. Anglers looking for big redears, better known as shellcrackers, should look shallow, as these fish are in the mood to spawn as the days get longer. Use your trolling motor to move along in shallow bays and backwaters, looking for hard gravel banks and bottoms. If you locate this situation, use a redworm or piece of a nightcrawler on a tiny hook and light line, and bump your offering along the bottom under a small split-shot sinker. Once you locate shellcrackers, there is a better than average chance you can catch numerous fish from one spot. Shellcracker bites can be notoriously light, so be ready to set the hook when you feel “dead weight.” Though their bite is light, they fight hard, and are delicious on the dinner table. OTHER OPTIONS: In Nickajack tailwaters Catfish are moving upstream, and meaty baits are the ticket. At Lake Barkley: Catch big largemouth on topwater plugs as they move shallow to spawn. As the days get longer, and the heat cranks up, anglers on Chickamauga Lake head to the ledges for schooling largemouths. Once bass are finished spawning, they will migrate to drop-offs and humps on the main river channel. These fish can be easily located using electronics, and can be caught using a variety of lures. Deep running crankbaits, long plastic worms, large swimbaits, and lizards can be used once fish are located. With the Florida strain largemouth ever present in the lake, have your equipment ready to tussle with a truly big fish. This is also a time that bass will gather in large schools as they follow shad throughout the river system. Often this month multiple fish can be caught from one spot, often day after day. The presence of current through the river will also enhance fishing success. OTHER OPTIONS: Catch bluegills on Melton Hill as they spawn on the full moon. For Citico Creek Trout, head to the Cherokee National Forest with corn and worms to tempt the fish. With summer heat at its zenith, and electricity being generated at Watts Bar Dam, big white bass are going to begin schooling all over Watts Bar Lake. If fishing in the middle of the day is your preference, get a good lake map and locate the humps scattered all along the lake, and then cruise these areas looking for schools of shad and white bass with your electronics. Once located, catching them is easy if you bounce big jigging spoons along the bottom. Early in the morning and late in the evening, these same schools of white bass will rise to the top and can be seen slashing into schools of shad at a frenzied pace. These fish are easily caught by virtually anything that wobbles or flashes. Anglers can begin their hunt along the mid-lake section of Watts Bar, as this is the area that seems to hold the most action. OTHER OPTIONS: Wade-fish Little River, near Townsend, for smallmouth action in the shallows. For Kentucky Lake Crappie, fish under the lights with minnows and light line. It’s the hottest part of summer, and big blue cats are on the prowl in the mighty Mississippi River. No fish in Tennessee pulls harder, and these big cats are super strong after spending a lifetime fighting the current of America’s grandest river. Heavy tackle is going to be a must, with big sinkers being paramount in keeping your bait in the strike zone. When it comes to bait, nothing works better than cut shad, carp, or suckers for truly big cats. Look for fish to patrol ledges and around manmade structure, and use the current in your favor to drift fish these areas. Use a three-way swivel offering, with a football sinker beneath, in order to keep your bait slightly off the bottom. Remember, big blues are predators, and they are going to be looking for an easy meal, so give them exactly what they want. OTHER OPTIONS: Fish below the Fort Loudoun Dam with live bait for stripers in oxygen-rich water. For Pickwick Lake Bass, fish at night with jigs for a mixed bag of smallmouths and largemouths. When it comes to river trout, the Clinch River is second-to-none for numbers and quality fish. Depending on current flow from the dam, anglers can wade or drift fish for eating-sized or trophy browns and rainbows. With no generators running, wade the runs and fish the current seams, using corn, worms, Powerbait, or small spinners to catch eating-sized trout on light line. For big browns and rainbows, the best option is to use your boat when TVA is running one generator, with jerkbaits, swimbaits, and large spinners used to catch monster trout. Additionally, big stripers have been known to inhabit this stretch of river, and these monsters will also nail your offerings. Be advised that there is a 14- to 20-inch slot limit, and only one fish per day may be over 20 inches, with the creel limit on trout being seven. OTHER OPTIONS: With cooler nights, Cherokee Lake bass are in the backs of creeks to feed on shad. Wade fish the Holston River with small plugs to catch big smallmouths just outside of Knoxville. It’s hard to beat the taste of fresh walleye, and anglers have the opportunity to experience that in East Tennessee on Norris Lake. While the fishing can be consistent this time of year during the day, nighttime is when these toothy critters grow fangs and become true predators. Local anglers use a couple of methods to put walleyes in the boat and casting large stick baits to flooded brush is one of them. As TVA draws down the lake, the flooded brush becomes more isolated, making it easier to pinpoint likely areas that hold big walleyes. Keep your lure moving at a slow pace, v-waking it just beneath the surface. This method can entice some ferocious strikes, so be ready to react quickly. Another locally utilized method is to fish under the lights with minnows. This sometimes leads to bonus catches of crappie as well. OTHER OPTIONS: For big French Broad River smallmouth fish near the confluence of the Holston and French Broad rivers. To catch Cumberland River stripers throw big swimbaits or live shad. With most outdoorsmen turning their attention to deer season, many Tennessee River impoundments are void of fishermen. This is a shame, as some of the hottest crappie action of the year is occurring all along the river system. Whether it’s East, Middle, or West Tennessee, crappie are following shad to the shallows, and anglers armed with light line and small jigs can flip docks and boat slips to quickly fill a livewell with slabs. With cooler water temperatures, crappie are in the mood to feed, and will school up tight in shallow water areas to gorge themselves on shad. Depending on water clarity, red and chartreuse, blue and white, orange, or yellow and white, are hard to beat as they are slow rolled underneath deep water docks. Additionally, when large schools of shad are located, don’t be afraid to pull crankbaits for jumbo size slabs. OTHER OPTIONS: For Reelfoot Lake channel cats, use nightcrawlers around structure to catch eating-sized fish. Tellico River Trout provides good rainbow fishing for anglers using brown spinners, worms, and corn. Perhaps no fish tastes finer than saugers pulled from the cold, winter waters of the Tennessee River system, and the area below Pickwick Dam is, perhaps, the most fertile area in Tennessee to catch these toothy critters. Tennessee anglers hoping to hook up with one of our most underappreciated fish should use heavy, brightly colored jigs to fish in the rocks below the dam. Brightly colored hair jigs, tipped with a minnow, are great choices, as anglers fish along current seams below the dam. Be prepared to lose some jigs in the rocks, but also be prepared to set the hook. Depending on the strength of the current, anglers can cast to the current seams where saugers stack up or do repeated drifts while vertical fishing. The areas downriver of the dam, in the mouths of creeks, will also hold saugers, with these fish being caught by casting slightly smaller lures. OTHER OPTIONS: For Watts Bar amallmouth cast pink and white hair-jigs to chunk-rock banks. To catch Tennessee River blue catfish, fish deep holes with cut shad.